I was given this book by Dr. Brown who was the president of Denver Baptist Theological Seminary when I was a student. 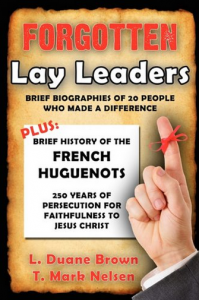 It is a quick read about forgotten heroes of the faith, forgotten because they were never well known. I especially enjoyed the stories of American wilderness history and those related to English history: Newton/Cowper and Carey/Gotch. The last section on the history of the French Huguenots by Mark Nelson and the story of La Rochelle, France was very unusual and interesting.